Good Monday morning to everyone out there! Hope you all had a great weekend and are ready to take on the work week. We will have a seasonable and mild start to the week, which will help us recover from that icy system that swept through over the weekend. Temperatures are in the mid to low-20s and cloud cover is low. Slight winds are coming from the north, which will bring in that crisp and cool air. Might be a cold start to the day but don’t worry, it’ll warm up. A strong high-pressure system will be moving into the area and will keep conditions clear all day. The temperatures are expected to increase into the low-40s with winds increasing to 5 mph. While mild conditions are expected, those northerly winds will add some wind chill values that will slightly cool the air temperature. 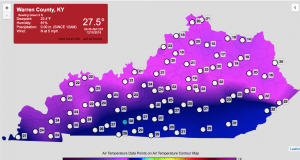 Tonight, the lowest temperatures are expected to dip into the low-20s. However, the high-pressure system will be propagating to our east, which will then shift the northern winds to come from the south. Tuesday is going to consist of a slight warm-up for the day. The high pressure will begin to move East, which will cause the clockwise winds to draw southern air into our area. The skies will continue to stay clear and sunny. You can see the orange values come into the south-central Kentucky area. The wind barbs shift from the north to the south, this is what will help warm things up. Temperatures will increase into the mid-40s and winds will strengthen to around 9 mph. As the sun goes down, temperatures will decrease into the high-20s. Wednesday will call for more cloudy conditions and increasing chances of showers throughout the day. Temperatures will increase into the high-40s and maybe low-50s. As the night approaches, a shower or two may sweep through the area. Temperatures will decrease into the low-30s and winds will be calm for the night. Showers for the rest of the week and temperatures will increase into the 50s! For now, enjoy this mild start to the week and take in that sun. You all have a great week, follow @wxornotBG on Twitter for the latest updates. Come back tomorrow for any updates in the forecast.